(STILLWATER, OKLA. / Dec. 28, 2015) — The Stillwater League of Women Voters, Stillwater Chamber of Commerce’s Government Affairs Committee and Friends of the Stillwater Public Library welcome community members and elected leaders to attend the “2016 Legislative Reception” on Thursday, Jan. 14. The come-and-go event, which takes place in the Stillwater Public Library auditorium from 5-7 p.m. give citizens the opportunity to speak one on one with several local officials. Senator James Halligan and Representatives Cory Williams, Lee Denney and Dennis Casey will be present to provide information on the upcoming legislative session and to answer community members’ questions. Other elected officials invited include the Mayor and City Council, Payne County officials and the Stillwater Board of Education. Stillwater city management has also been invited to attend. Officials running for open positions are invited to attend and speak personally with citizens, but are not able to address the audience as a whole. For more information, please visit the library’s website at http://library.stillwater.org or contact Lynda Reynolds at 405-372-3633 x 8101 or . The Stillwater Public Library is located at 1107 S. Duck St. (the corner of Duck and 12th Ave.). Library hours are Monday-Thursday, 9 a.m. to 9 p.m.; Friday and Saturday, 9 a.m. to 6 p.m.; and Sunday 1 p.m. to 5 p.m. The City of Stillwater is committed to providing information to Stillwater residents and visitors - ensuring that Stillwater's city government is transparent and that resources are accessible to all. 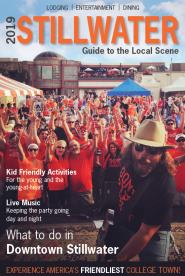 The City of Stillwater press releases provide information on special events, road construction, emergency management, and more.